This larger packaging is something that customers have long requested on MyStarbucksIdea.com. For those who don’t remember, right now Via comes packaged in single serve packaging, where one single stick of Via makes an 8 ounce cup of coffee. I have numerous previous blog posts about Via. Click here to go back and look at previous articles on Via. On a personal note, I almost have mixed feelings about this. I feel like a lot of the magic of Via is in the packaging. I really love the ease and convenience of a stick of Via. What a hassle-free easy way to make a single cup of coffee at home. At it’s always fresh because it’s unopened until the moment of use. Don’t laugh, but I would rather see the flavored Via products in a jar than the regular Via varieties. I use the caramel and vanilla flavored Vias as ice cream toppings, and it might be nice to scoop it out. 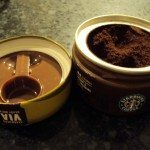 It seems like it will be almost impossible for Starbucks to really control the quality of the flavor of the cup of coffee with Via in a jar. The risk here is that a customer will buy a jar of it, open it up and have a cup, place it on his or her kitchen shelf and forget about it, and then months and months later, and use it again. The second use of it, many months later, may have some deterioration of flavor quality because it’s been exposed to oxygen. I’m not really sure how this packaging in a little jar will hold up weeks and months after its first opened. Nonetheless, this packaging will probably make people who cook with Via very happy campers! I just was chatting with a barista the other day that says he puts the Colombia Via in his favorite home-made chili recipe! Cooking with Via is a big thing! I owe a big thank you to my twitter follower @Sbutler66 who generously offered to mail me this jar. I took a photo of the Via near a 3-ounce cup so that you can size-up how small this packaging really is. What do you think of Via in a jar? Melody – I am always amazed at how you find things out before us partners do! I haven’t heard anything about us selling it in a jar here…but, I’m not sure if the sku guide for the new promotion period is out yet. I’ll have to look! I’m probably wrong, but I’ve heard from people that instant coffee is big in the UK…which may be why they’re selling it in a larger package there. If that’s their coffee of choice it would be silly to buy it in a package of 12 sticks, it’d be gone in a matter of days. The instant phenomenom isn’t quite as popular around here, so perhaps they won’t launch it this way for us? The UK has a much bigger instant coffee market than the US, so it makes sense that they would launch there. I am really digging the container. Not surprising at all that it was launched in Europe prior to the US. In Greece a “cafe freddo” or “frappe” might as well be called the national drink. You could get them anywhere. Cafes would have two tubs, a barista would take a scoop of Nescafe from one, a scoop of sugar from the other, add water, stir in an electric mixer (leaving a small layer of foam on the top) and serve. At Starbucks in Greece they had a drink on the menu called the “espresso freddo”, nothing more than what we know as an iced espresso but mixed in an electric mixer with the resulting layer of foam on top. It took me my whole trip to realize that it was because Greeks had come to expect foam atop their iced coffee simply because iced instant coffee needed to be thoroughly stirred and by doing so, foam was the result. My point, however, Europeans drink a ridiculous amount of instant coffee. It could only be assumed that bulk quantities would first go on sale there. I’m all for the jar version. 🙂 On one hand, i agree with you that instant coffee loses some quality after being exposed to oxygen. On the other hand, for people like me who drink it daily when feeling too lazy to trot over to Starbucks, this version may be more environment-friendly (well, economical is also a plus, hehe) than disposable packaging that takes years to degrade. If I kept all the VIA packaging I’ve thrown out since I first discovered it, it would probably measure over 2km already. I think it might be in the UK first because the instant market is HUGE there. Partly because the American coffee maker is rare there but also because it’s as convienient as making tea. I am not a fan of Via, but I do actually like this idea better. Less packaging, etc. If you don’t mind, I’d like to ask a photo about the cup you used in the photo: It’s a 3 ounce “demi” cup. It looks like the ones they are currently selling in the Starbucks stores around here, however, they are only selling the Tall, Grande and Venti sizes. Are they selling Short (and demi) in Seattle stores? I believe that during our VIA Launch training that the instant coffee market share was stated to be around 7 billion dollar annually. (if I’m wrong someone please provide redirecting feedback) That’s a HUGE pool. With Europe having the largest piece of the pie. All I know was when I was in England brewed coffee was never something I saw (outside of Starbucks) I was always offered instant coffee. 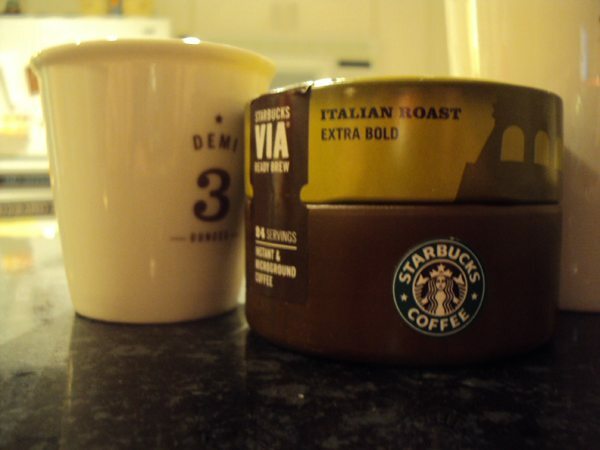 Instant coffee outsells regular 10-to-1 in the UK. These little tins are available in Uk stores but at the moment it’s a limited amount and only in certain stores, but were behind the times with the flavoured via and only have colombia and Italian roast available out here. Like you say mel the sticks make things easier, the tin is amazing if u drink our via at home pop out the little scoop and have 24 coffees at home or 12 if u like it strong ha. Via sticks are fantastic on the go coffee whenever u like it! IF they do bring the jars to the US, I hope they keep the packets. VIA isn’t something that I drink daily. Instead I drink it when I don’t feel like making coffee later in the day at work or when I’m travelling. I always have a few packs in my purse. Melody love the thought of putting the via on ice cream! Never thought of that. I never realized how big the instant coffee market is in Europe. Nice pics of the jar. I thought I’d add my two pence worth, or cents if you’d rather. I agree that the original VIA packaging was so great because of the convenience, and the freshness. With that in mind I was interested to see if there would be any loss of flavour over time. 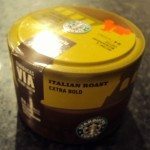 I originally bought a couple of tins of the Italian Roast. I’ve had one open in my work drawer for almost 50 days at this point as part of a mini experiment. I’m happy to report that this morning’s coffee tasted just as fresh as one made from a more recently opened tin. So in my mind there are no concerns about compromise of quality or freshness over time. 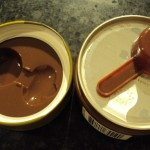 With regards to the convenience factor, sure it’s not as convenient as the original VIA packaging, but it is not a hassle to quickly scoop out a serving using the supplied scoop in the lid. Unfortunately, previous comments are correct; the instant coffee market is huge over here in the UK, I don’t like it, but it is a fact. Although sales are 10-1, I think it would be unfair to say that there isn’t a large presence of brewed coffee outside of Starbucks here. Coffee houses have been open here since the 1600s and pretty much everyone I know has a coffee machine and/or a French press… it’s just habit for too many people to offer instant. I apologise on behalf of everyone if this has happened on your visit. (Come visit me next time!) Outside of Starbucks, my favourite source of beans would the East India Company (http://ow.ly/4v46D). At least next time you’re more likely to get some VIA. Not sure I like this, but what can you do? Now, to the topic here. BOO! 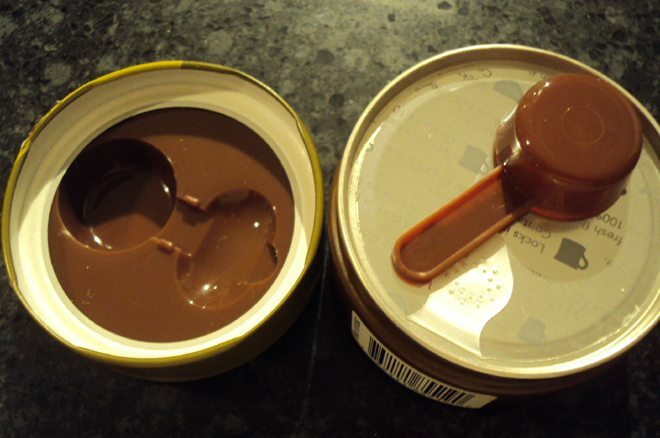 I am not a fan of this idea, (VIA in larger containers) but it doesn’t surprise me. In fact, I think there’s very little Sbux could do anymore that would surprise me. While I do enjoy some of the VIAs, and think they serve a purpose, I wish they would stop expanding it. It’s enough. stop. Of course, for people who use it in greater quantities, I guess it’s a good thing. I’m not sure where I think this should be sold……hopefully not in the cafes. maybe in the baking section of groceries? I don’t know. Doesn’t make me happy. NICE! 🙂 Can’t wait to get a few of these when I’m home again in a while. I do agree with you though on the flavored ones, they would have them in these also. But i think it is a really natural progression for Starbucks to make this. When you think of it, this is instant coffee, and it wouldn’t make sense to always have it in small single serve packets. Instant coffee is consumed a lot at home and the last decade or so has always been in big jars for convenience. If Starbucks really wants to capitalize on this huge market like Howard says in the book they have to really make serious products that rival the others on the market and small single serve just wont do that, love this new product really great step forward for Starbucks and another really big step also! @CD – I have a lot of comments to make, but quickly this one’s for you! Funny about that 3 ounce cup. I haven’t seen hardly any of them in Seattle. I don’t know if they just sold out fast or what happened. I was down in OC last month and saw numerous stores with the 3ounce cup, and didn’t want to put it in my language and thought, ‘well, for sure I’ll find it home in Seattle.’ I got home and found an unexpected present from this blog’s commenter @pencil_to_paper – She had sent me the 3 ounce cup from her stores in Texas! I have no idea how she knew I wanted it!!!!!! 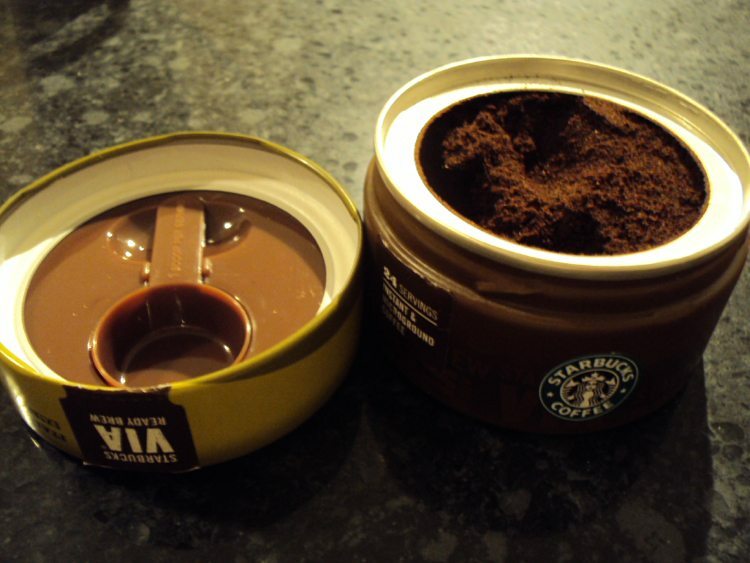 I wonder if SB is using this Via jar as the beginning of their efforts to expand their market share into stores, etc. as they said were going to do come March. I wonder what they will do if they introduce this into the USA and it does not take off like it did in Europe. I’m brought back to the Shareholder’s Meeting where two years in a row someone asked Howard for a VIA jar. And for decaf VIA… even though decaf VIA was available when she asked for it. As I sit here eating my perfect oatmeal, and drinking my tall nonfat caramel machiatto, I catch-up on the most recent posts. I’m very excited to be able to buy via by the jar. As a single person, only needing a cup at a time, I use via frequently, and even at home. It’s pretty good coffee, and a lot faster and more inexpensive than brewing a pot just for me. Sometimes I’m in the mood for a french press, but not always. I usually want something quick, and I was so excited when via came out. Now I don’t need to have the little packets at home, and can use those for travel. So Melody, I’m loving the new via in a jar!! It does seem a little odd to me that places other than the U.S. would so be into instant coffee – I thought they were, you know, more particular over there! I do use Via in cooking as well – hermit cookies mostly! This really makes sense. Walk into any supermarket in Ireland you will see instant coffee dominates. People just don’t get beans. We are a nation of quick fixes re drinks. From tea bags to coffee in a jar. Try to get a good drip coffee machine, you can’t. It’s limited. Espresso machines yes, but drip, no. Of interest to me is the size of the tin. How much Via per serving. Traditionally Via sold here in Ireland is less then that sold in America. It’s on purpose, designed for small coffee/tea cups. Alas we drink mugs, so the first impression of Via from all my family and work mates is it’s watery. I did have a work mate experiment a few times to get it right. He found half a mug of water is perfect. The benefit of the jar is you can now easily have 1.5 servings per mug to bring it up to American strength. Flavoured Via is launching here next. It would be interesting to see the form factor. I wonder if the packaging is recyclable!? Very interesting packaging (bet there are some patents on it). For the most part my opinions of usefulness of “jar VIA” are very similar to your’s Melody (particularly regarding flavored VIAs). However, for those of us that do use a lot in cooking, I could easily use a jar of the regular VIAs in a weekend of cooking. I appreciate your readers who keep you well informed. I’m excited about the multi-serving tin! I love to bake & cook. This will make playing with Via easier! (I think it tastes SO much better than other instants). 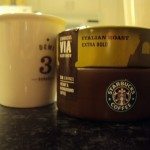 I’ve tried the single serve packets for a late afternoon pick-me-up. I had no idea the instant coffee market was so large in the UK & Ireland! 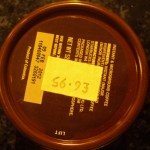 @DadCooks- I hadn’t thought about patents on that packaging but it wouldn’t surprise me if you are right. I think the little measuring spoon is very cute! @Hobo’sFriend – I’m glad you are excited about this! I don’t know when it launches here in the United States. but right now it’s just in the UK. I’m sure we will get eventually. @CamSpi and @LatteRose- I thought about the woman at the shareholder’s meeting too! Didn’t she ask nearly an identical question two years in a row? Her wish has now come true! That sounds cool. I like the jar cover. Haha. 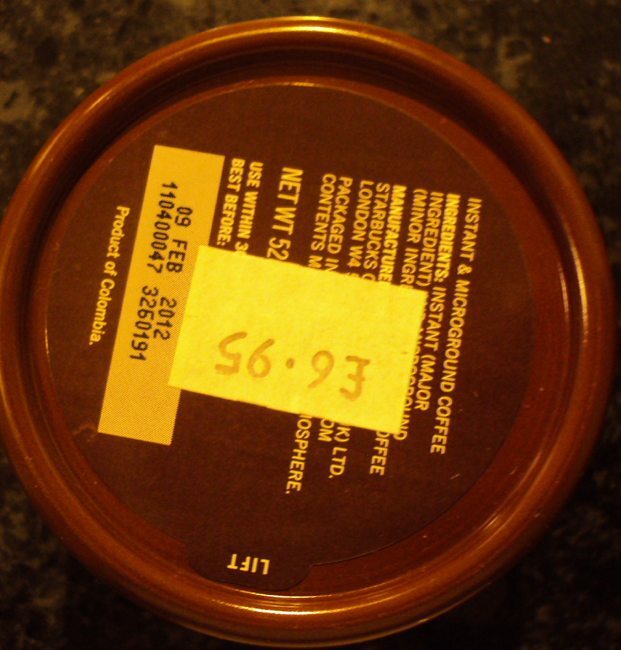 Just noticed the pricing under the jar. It works out a lot cheaper per cup to The pack of 12 works out around 50 cent (euro) per cup, whilst this at UK prices is around 30 cent per cup. Great! I recently sent some VIA to a friend serving in Afghanistan. Hi David! This is really just a UK product right now. I don’t want you to go hunting for it and end up with a ton of frustration. Sooner or later, I bet we will see it here. Ooo! I’m excited about VIA in a jar! I drink VIA every morning at home because it’s quick and easy, doesn’t get anything dirty besides the cup, and tastes as good as any cup of coffee. But I hate throwing away all those little packages! It’s the only thing in my life that is not “green” but I just love drinking VIA at home! So a jar is perfect for me! However, they still need to have the little packets, those are just brilliant for coffee on the go when you can’t make it to a Sbux store. I’m lucky enough to live in Seattle, so I’m never more than a few steps from a Starbucks store when I’m out. But for home, when I don’t want to change out of my PJs yet, and camping (got’s to have my Sbux still) I love VIA! Yay more options! Good reporting Melody! How neat to see VIA from another country, so nice of @Sbutler66 to send it! @Kelly – I can’t wait for this. It’s more economical, and it’s shocking how much Via I’ve been drinking. Much easier than making a whole pot of coffee when it’s just me in the house. @Melody — just wait until later this year when the Starbucks-Keurig and Starbucks K-cups arrive! Just like VIA is a coffee unto its own (and unfair to compare to fresh ground beans brewed to perfection) the Keurig is worthy of counter space and I ber Starbucks will formulate so great blends for the K-cup. Start looking around, there are Keurig machines that take up no more room than an electric kettle all the way up to monster mini-microwave size. I never thought of putting Via on ice cream! That’s probably yummy! I think larger via is a great idea and I hope we get it here in the states soon! I got myself a gravatar but I’m not sure how it works… LOL. Just wait until the coconut syrup comes back – this partner will be a caffeinated, sugared up mess. YUM. Great post. I don’t like the idea of all that plastic just to make that jar. The lid makes scooping convenient, but all that excess plastic just makes me sad. One of the great things about selling it in a jar is to avoid as much trash. This does not help that effort much, if at all. Melody, any update on this? It’s the last half of 2013 now, and I still don’t see it available for sale in the U.S., or online. I will buy it, if it ever arrives! @Maggie – I’m sorry to say, but as far as I know, this has remained a Starbucks UK (maybe other parts of Europe?) product only. Not available in the U.S. I gambled that it would be eventually launched in the US, but I guess not. Sorry! I’m surprised that it hasn’t been launched in the US as yet, but it’s nice to have something that is unique to the UK. More often than not it’s the other way around. Ah, well, one more reason to visit the UK sometime soon! Halfway through 2014, still nada in the U.S. Via is great for camping, but I’d love a larger size. Still waiting in Canada……..Starbucks….are you listening???? ?